Click on a Tree's Botanical Name for that tree's page or on a tree's locations for maps. Below is a listing of the identified trees in the Kendal Crosslands Arboretum. 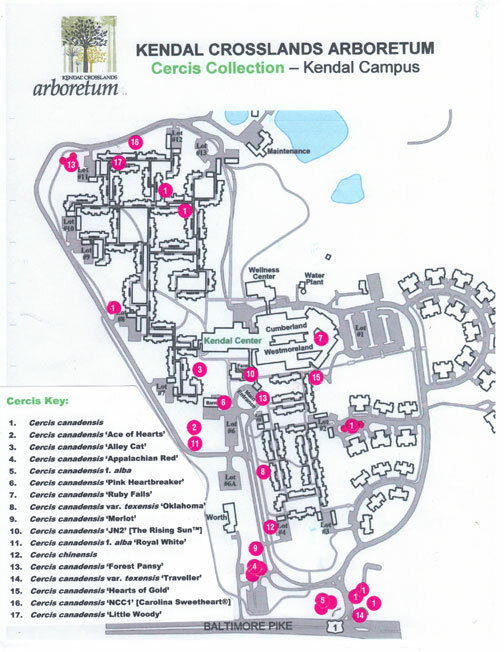 Location indicates the campus (C for Crosslands, and K for Kendal) and the area on that campus. Individual tree lists and maps may be viewed, downloaded or printed from the Walk Maps tab or may be viewed by clicking of the location designation on the table below. Hard copies of these lists and maps are available at the reception desk of each campus. Guided tours for groups are available by calling the KCC Staff Horticulturist at (610) 388-5558 at least one week ahead. Photographs of each tree's details may be viewed by clicking on its Botanical Name. Photos enlarge when clicked. Tree Notes are below photos. The tree table is searchable on every attribute.